Timeline: Historical Events - Had a five player game of Timeline and while I still enjoy the game and found it fun with more players, I can see how the replay value just isn't there. As it's my game, after playing seven times I've got a distinctive edge as you do start to learn roughly when certain events happened. Its a double sided edge - one of the main appeals to Timeline is that you are learning, but the more you play the less playable the game becomes as you'll remember and memorize when certain events happened. For the price and ease of play, I'd still recommend Timeline - just don't play it too much too soon! Timeline: Science and Discoveries - While the aforementioned version of the game is mostly filled with cards you've heard of and your knowledge combined with a bit of deduction of the artwork can lead to some educated guesses, I find Science and Discoveries all guesswork. Science isn't a particular strong point for me. It could be coincidence, but having tried this with six different people now each time has gotten the same result. It's mostly just random guesses and a bit of luck that wins the game. Mixing the two together just adds a luck of the draw as to who gets the Events cards and who's stuck with Science cards. This edition will suit certain people more of course but just generalizing, Historical Events will appeal to most and is the better version to buy. Cardline: Globetrotter - As I mentioned last week, when I purchased a first in the Cardline series I thought it would blend with Timeline. Same concept, different games - they don't mix. We gave the population variant a try and found it very similar to Timeline: Science. Our group was mostly just guessing the population of countries we'd never heard of and even when we did know the country we still found ourselves mostly guessing. Again, people who know lots about countries populations, land mass, gdp and waste will find a lot of fun here and a bit of a challenge. For us commoners with limited knowledge outside of a few of the major countries, this was another guessing struggle. Pretty sure I accidently did guess one card right before the game was won. Scythe - Finally. The behemoth that is Scythe, one of the top 10 games on boardgamegeek's infamous board game rankings, a game with mostly critical acclaim and praise over the last year. After reading reviews, scoping out pictures and looking for sales - I decided I would not be adding Scythe to my library for some time to come. Why? Well, nothing at all about Scythe, just more the current state of my library of games which features 15-20% of the games unplayed and another 25-30% of games that have only been tried once. Scythe is a beast and I have a few beasts like Mansions of Madness, Fury of Dracula, Terraforming Mars, Blood Rage, Crisis, Dead of Winter (and the Long Night), Through The Ages, Powergrid, and others that rarely or never have been played. I came to the conclusion as much as I wanted Scythe it would be pointless to add it to the list of unplayed games that take a while to play at this point in time. That's where a good friend came in handy. We've often played board games together but his first modern board game purchase happened a couple of weeks ago and it happened to be Scythe. Being the only game in his collection, I'm sure any time we are at his place to play a board game it will be Scythe - brilliant for me. Now that I've explained why I personally don't have Scythe - how was my first play? It was a struggle to be honest. Not because of the game, but because it was the first game in ages that I've played without reading the rules first! I don't know how many rules we played wrong but I have a feeling there was a fair few. It didn't matter too much as I still got to experience and appreciate the scope and beauty contained in Scythe - and even though rules were realized and discovered throughout the whole game, I still had a lot of fun. Just wish I had a better understanding of how the game is meant to be played and some of the rules we were initially playing didn't seem to make a lot of sense which made for a bit of a lesser experience for my first Scythe night. Regardless, I'll be back for more (and can't wait), but am definitely going to read the rule book first! 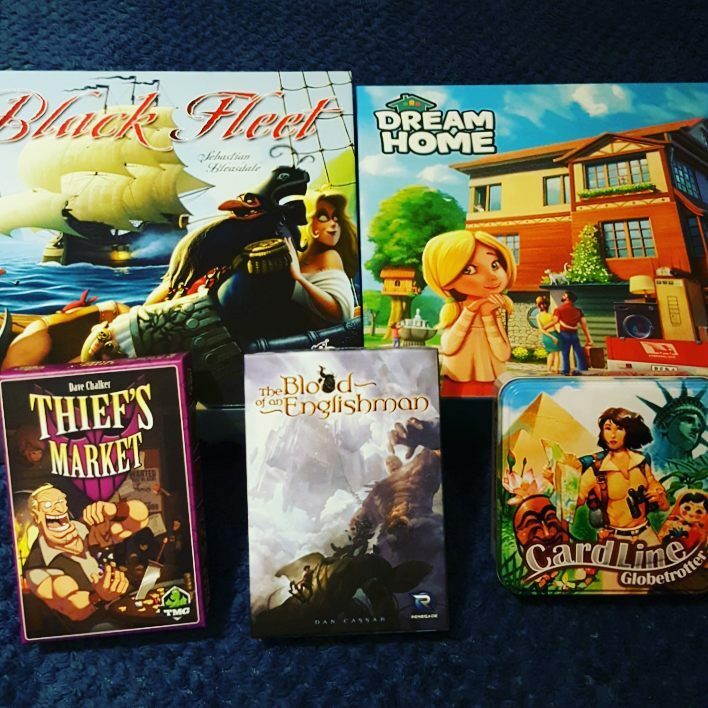 Time for the other half of last weeks purchases..
Black Fleet - I bought this for two reasons. #1 It's pirates. #2 It's got some good looking components including metal coins. Will try it eventually! The Blood Of An Englishman - For me two player games are some of the easiest to actually get to the table and get played. The obvious reason being you only need to convince one other friend rather than get a whole group together. Blood of an Englishman was purely bought on a whim. It was cheap, I know I'll be able to play it and it features asynchronous gameplay which is something I really enjoy in two player games. Rhino Hero - I saw this in a shop for $20 so I decided after seeing a fair few Instagram posts I may as well see what its all about. Not in a rush to play it, but am sure the mood will strike me on a non gaming night and this looks like the perfect 'activity' game to turn a night of nothing into a night of board games.